Exclusive: The near-three-decade-old Pan Am 103 case — a plane bombing over Lockerbie, Scotland — shows how a dubious “group think” of Official Washington not only withstands scrutiny but can become the foundation for further allegations and become “history,” as John Ashton describes. 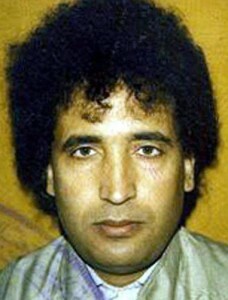 Libyan agent Ali al-Megrahi, who was convicted by a Scottish tribunal for the bombing of Pan Am 103 over Lockerbie, Scotland, in 1988. Megrahi, who always asserted his innocence, died in 2012. He implicated a number of others, including Masud, whom he described as a bomb technician. Masud was never apprehended for the bombing and when German prosecutor Dethlev Mehlis went to Libya to interview witnesses all denied his existence, as did the Libyan witnesses in the Lockerbie case. There is also no doubt that the La Belle case is far less straightforward than portrayed in the film. At the time of the bombing, the Reagan administration was involved in a large, secret and dirty war against Libya. From the time Reagan took office in 1981 his government exaggerated the country’s role in terrorism, which it claimed, falsely, was central to a Soviet-directed global conspiracy against the West. According to the documents, the Iranians contracted out the job to the Syrian-based Popular Front for the Liberation of Palestine, General Command, which had a track record of blowing up aircraft. One document, from 1991, stated, without naming the PFLP-GC, that the Iranian interior minister Ali Akbar Mohtashemi paid the bombers $10 million. Two months before Lockerbie members of the group were arrested in Germany, including bomb-maker Marwan Kreesat, who had made the bombs used in previous attacks. He admitted building bombs into Toshiba BomBeat radio cassette players, the same brand that housed the Lockerbie bomb ,and said the group was planning to strike a western airliner. Other members of the group and at least one of his bombs evaded detection. The key evidence that led the investigators away from Iran and PFLP-GC towards Libya was a small piece of circuit board known as PT/35(b), found within a blast-damaged piece of a Maltese-made shirt. The prosecution case at Megrahi’s trial was that it matched boards made to order for Swiss company Mebo by its supplier ThÃ¼ring. Documents unearthed by Scottish Criminal Cases Review Commission (SCCRC), the statutory body that investigates alleged miscarriages of justice in Scotland, highlighted more anomalies. They included a police memo stating that PT/35(b) had been tested for explosive residues and found to be negative, which contradicted the court testimony of the Crown’s forensic experts, who said that no such tests had been done. Metallurgical analysis showed that the fragment’s copper circuitry was plated with pure tin, whereas the boards made by ThÃ¼ring, which were used in the timers supplied to Libya, were plated with a tin-lead alloy. Crown scientists had speculated that the explosion had changed the plating, but tests commissioned for the appeal disproved the theory. The work demonstrated beyond doubt that the Lockerbie fragment was not, as the court had accepted, a match for the Libyan MST-13s. Also of great importance to the prosecution case was a fragment of brown checked trousers containing a sewn-in label of a Maltese manufacturer called Yorkie. The item led the police to a shop in Malta called Mary’s House, where the proprietor, Tony Gauci, recalled selling a bundle of clothes, including brown checked trousers and other items found among the Lockerbie debris, to an oddly behaved Libyan a few weeks before the bombing. Burton is no Lockerbie dissident, he believes Megrahi and Libya were guilty, but, if true, his indiscretions throw a big wrench into the prosecution narrative, which held that the evidence to support the claim was uncovered by the police well in to 1989. Perhaps the hardest fact of all for the defenders of Megrahi’s conviction, which has barely been reported in all the coverage generated by My Brother’s Bomber , is that in 2007 the conviction was referred back to the appeal court by the Scottish Criminal Cases Review Commission on no fewer than six grounds. John Ashton is a British writer and researcher. From 2006 to 2009 he worked with the legal team fighting to overturn Abdelbaset al-Megrahi’s conviction for the Pan Am 103 bombing. He is the author of Megrahi: You are My Jury The Lockerbie Evidence (pub. Birlinn 2012) and Scotland’s Shame: Why Lockerbie Still Matters (pub. Birlinn 2013). First I want to say thank you for this page to Robert Parry, the authors he publishes and the commentators, too! When somebody starts asking me questions, why I suddenly care so much about international politics, this is the very first page I recommend. I wish there was something comparable in German, but if there is, I didn’t find it yet. At least we’ve got a German RT since one year, and they’re about to expand. It is great to now have this article to point people to, who want something more than me claiming that all was not as it has been told by the media, about La Belle and Lockerbie. I am sorry to go sort of off-topic, but I have so many questions left, and I would love to get some feedback from you erudite people on here about some of the claims being made about Gaddafi, his plans and system of governance. I heard he planned the creation of a pan-African currency by name of Gold Dinar, to be initially backed by his private holdings of more than 100 tonnes of gold, and that he invited Middle Eastern Arab countries to participate as well. If this was a viable plan, it would have certainly undermined the world reserve currency status of the Dollar, esp. if OPEC-countries would have eventually taken him up on the offer to participate in the prospective African bank. Sarkozy reportedly said this project would be a “threat to the financial security of mankind”. That sounds quite serious, Gaddafi’s financing of an African satellite must have cost certain interests a small fortune in missed fees already, but such an alternative currency system, if viable would have had potential for cataclysmic shifts in international finance. What is your view – did Gaddafi sign his own death warrant with these plans? Also – where is this gold now? A similar claim has been made about Saddam Hussein planning to sell oil for Euros, but as far as I know, he backed away from that project under the pressure of the sanctions..? What I am also curious about, Ã­s whether it is true, that Libya had a sort of revolutionary direct democracy system in place, a “third way”, not capitalism nor communism, following Gaddafi’s famous green book? If it was in place, did it actually work – did his popular councils determine politics for the public good, or was it simply your garden variety authoritarian, but benevolent dictatorship with strong economic nationalism? When I read, that Libya went from being the poorest country in Africa with a literacy rate of 20% to being the richest one with 83% literacy, with free and quality health-care and education, with a law against taking interest on loans, debt-free money generation and a complete lack of any foreign debt, while housing was considered a human right and people received start-up money and goods when founding a family or farm, I have to conclude that yes, something seems to have worked quite beautifully in practice! Could therein lie one of the reasons, why the sudden attempt at installing a parliamentary democracy failed so miserably? Since Gaddafi viewed such a system as inherently corrupt – and who could contradict him on that one with a straight face – I suppose the respective state-institutions were simply not in place. There are videos of Gaddafi cruising through Benghazi waving out the open top of his car at cheering people coming into the street, no security, no nothing. I remember reading, that the UN and Amnesty finally proclaimed, that Gaddafi’s police did not shoot at unarmed people at all, that the violence in the big cities came from opposition groups, not police. So please, enlighten me a bit about this enigma (at least for me), of Libya under the Colonel! Lusion, I don’t think your comment was off-topic at all, and I regret that I am not knowledgeable enough to tell you much you don’t already seem to know about Gaddafi’s Libya. Like you, I have read about Gaddafi’s ambitions to liberate the oil trade and other international commerce from dependence on the U.S. dollar. I don’t know how realistic the plan ever was, or how much of a concrete threat it ever posed to U.S. hegemony. But certainly this is just the sort of activity by foreign statesâ€”as opposed to the endlessly malleable category of “terrorism”â€”that is most likely to earn the true and lasting enmity of the U.S. government. I have no expertise in the ideology or methodology of Gaddafi’s system, but its achievements in improving and modernizing the lives of the Libyan people according to all the standard criteria, such as are reflected in the U.N. Human Development Index (literacy, public health, etc. ), are, I believe, beyond dispute. It is heartbreaking to compare such peace, progress, and prosperity to the chaos and atavistic power struggles that characterize Libya today, in the aftermath of the beneficent ministrations of the air forces and other agencies of the U.S., U.K., France, and allies. Similarly appalling is the contrast between Gaddafi’s pan-Africanism and the anti-Black pogroms unleashed in southern Libya by his downfall. It seems to me that a government with such vast achievements domestically would hesitate to risk losing it all by incurring the wrath of the militarist West just to kill some random people in a discotheque or on an airliner. Ultimately, however, such an assumption must yield to facts such as they can be known. I was a young adult in the U.S. at the time of the Lockerbie bombing. My brother took a Heathrow-to-New York flight only a few days later, which has always brought it close to home for me. My initial reaction was that is was very likely Iranian retaliation for the U.S.S. Vincennes’s shoot-down of the Iranian airliner the previous summer. (I quibble with John Ashton’s description of that mass killing as “accidental”, but only because I think the word doesn’t do justice to the depraved negligence of the U.S. Navy, not because I believe there was an active intention by the Vincennes captain and crew to destroy a civilian plane.) If legitimate proof ever emerged that the responsibility lay instead with Libya, I would acknowledge it, but of courseâ€”as well documented by John Ashton and other dissentersâ€”this has not been the case. Until reading this article by John Ashton, I hadn’t realized that attribution of the 1986 Berlin nightclub bombing to Libya was problematic in its own right. While I don’t recall ever being particularly taken by the Reagan administration’s campaign against Libya, it is only in retrospectâ€”having witnessed the apotheosis of U.S. irrational fixation, dishonesty, and criminal aggression that was the endgame against Saddam Husseinâ€”that I begin to see that the U.S.-Libya conflicts of that era may have been almost entirely the product of U.S. mendacity and aggression. One thing about John Ashton’s narrative that makes me a bit nostalgic is that in the 1980s it seems the CIA felt it had to go to significant pains to fabricate and plant phony evidence of Libyan responsibility for Lockerbie if it wanted the attribution to be believed by the U.S. media and public. These daysâ€”whether it be WMDs in Iraq; Gaddafi’s attempted “genocide”; a nuclear weapons program in Iran; the Syrian government’s using nerve gas; Russia’s “invasion” of Crimea and “aggression” in Ukraine, including complicity in the Malaysian Air shoot-down; or legitimizing coups in Ukraine, Venezuela, and Hondurasâ€”all the U.S. government has to do is make unsubstantiated accusations without any plausible evidence at all, and often in the face of obvious evidence to the contrary, yet its fictions are uncritically accepted and relayed by the media, and believed by almost the entire U.S. public. lockerbie is a strange story. that mostly goes unexamined. i was at a scots golf resort in ayrshire, at a time of the year when it should have been empty. but it wasn’t. it was full of spooks. if you would care to pay attention, the crash site had u.s feds on the site before the local constabulary arrived. almost as if all the feds knew were to assemble. in advance. and before the crash site could be secured, the us intell agents had picked over the debris. there is a photo evidence of this, by the way. the real story is that DEA evidence of cia involvement in lebanon heroin farming and trafficiking was on that plane. this is similar to the arrow air catastrophe in gander. the usa intell services blew up this plane. as they have blown up so many others. to hide the murder of one or two by hiding those deaths amongst a catastrophe. twa800. swissair 111. american 587. to name a few. How do you know it was spooks on the golf course, were they wearing CIA polo tops. This is an excellent account and I intend to re-blog it with credits naturally. Many thanks for this most informative and interesting article. Wonder where the CIA xmas golf outing is being held this year. Anyway, just another Conspiracy Theory article on Lockerbie. Short on facts. Long on bluster.Wonder what its like to be a supporter of the worst mass murderer in british history. I’ve been reading that the real reason the Pan Am flight was blown up by the CIA was because it was tied to the assassination of Olaf Palme; one of the passengers on board the plane was a trusted Palme aide with a suitcase full of incriminating evidence. Planting the new evidence to place blame on Libya seems to have worked. Thank you and my respect to the author for this treasure hoard of information. I will refer to this article in my blog. Absolutely the best article I have read on Lockerbie. When it happened, I never believed the official story. It did not pass the smell test or the cui bono test. But the official lie,Libya did it, was just the first veil. John Ashton has done a great service for Us Slaves On Massas Mushroom Farm, he rips away Veil 2:Iran did it, and Veil 3: Syria plus Palestinians did it. We are left with the long obvious truth: The United States did it. I will read ,reread and study this superb article. Thank you Mr. Ashton and thank you Mr. Parry. John Ashton also co-wrote (with Ian Ferguson) the book “Cover-Up of Convenience: The Hidden Scandal of Lockerbie”, which was published in June 2001 – five months after Megrahi was convicted for the Lockerbie bombing. Jan-Olof Bengtsson wrote a series of newspaper articles (in Swedish) about Bernt Carlsson’s secret meeting in London with De Beers on the very day of the Lockerbie bombing. Bernt Carlsson was of course targeted on Pan Am Flight 103 by the Civil Cooperation Bureau of P W Botha’s apartheid regime. The mass murderers of Lockerbie are named here: (https://wikispooks.com/wiki/The_How,_Why_and_Who_of_Pan_Am_Flight_103#Naming_names). Why would Libya or Iran welcome the obvious wrath of the US from this bombing.